As the township of Mallala developed in the 1870's the Catholic population had neither church nor private cemetery. Until St. Malachy's Church was built in 1882 the travelling priests provided services for the community. But for burials, the choice was either the Mallala General Cemetery which commenced in September 1869 and was located on Feltwell Road, or the Pinkerton Plains Catholic Cemetery, south of the River Light near Hamley Bridge.The latter was a long journey for the horse-drawn hearse and the grieving relatives and friends who travelled in horse drawn vehicles over dusty or muddy roads. In 1916 landholder Henry Edward Hallion donated a block from his land on Franks Road, 4 km. from Mallala for the purpose of a Catholic Church Cemetery, On 13 December 1916 a portion of Section 272 Hundred of Grace was officially transferred to the Catholic Church Endowment Inc. 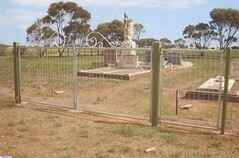 The Mallala Catholic Cemetery is a quiet and peaceful place, situated on a back road, surrounded by small trees and native mallees and interspersed with small cassias. With only 27 graves out of a possible 260, it would seem likely to remain as it is for some time to come. The family names recorded are Hallion, Howard, Meaney, Heilmar, Guldon, Fahey, Heilmar, Smallacombe and Temby. Information which details the position of the graves and provides personal details is on file at the Mallala Museum. The Mallala museum maintains a database of burial details for the cemeteries in the District. Please contact the museum if you are seeking information on a specific cemetery record. 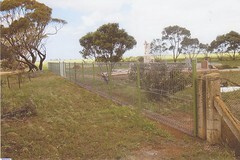 Do you remember Mallala Catholic Cemetery ? Then Join up and add your memory here.